Okra or okro (US: /ˈoʊkrə/, UK: /ˈɒkrə/), known in many English-speaking countries as ladies' fingers or ochro, is a flowering plant in the mallow family. It is valued for its edible green seed pods. The geographical origin of okra is disputed, with supporters of West African, Ethiopian, and South Asian origins. The plant is cultivated in tropical, subtropical and warm temperate regions around the world. The name okra is most often used in the UK, Canada, United States and the Philippines, with a variant pronunciation in Caribbean English and Nigeria of okro. The word okra is from the Igbo ọ́kụ̀rụ̀. The plant and its seed pods are also known as "lady's fingers". In various Bantu languages, okra is called (ki)ngombo or a variant, and this is possibly the origin of the name "gumbo", used in parts of the United States and the English-speaking Caribbean (via Portuguese and Spanish quingombo). In India, it is known by the names vendakkai (alternatively bendakkai) and bhindi. Okra is an allopolyploid of uncertain parentage (proposed parents include Abelmoschus ficulneus, A. tuberculatus and a reported "diploid" form of okra). Truly wild (as opposed to naturalised) populations are not known with certainty and the species may be a cultigen. The geographical origin of okra is disputed, with supporters of South Asian, Ethiopian and West African origins. The Egyptians and Moors of the 12th and 13th centuries used the Arabic word for the plant, bamya, suggesting it had come into Egypt from Arabia, but earlier it was probably taken from Ethiopia to Arabia. The plant may have entered southwest Asia across the Red Sea or the Bab-el-Mandeb straight to the Arabian Peninsula, rather than north across the Sahara, or from India. One of the earliest accounts is by a Spanish Moor who visited Egypt in 1216 and described the plant under cultivation by the locals who ate the tender, young pods with meal. From Arabia, the plant spread around the shores of the Mediterranean Sea and eastward. The plant was introduced to the Americas by ships plying the Atlantic slave trade by 1658, when its presence was recorded in Brazil. It was further documented in Suriname in 1686. 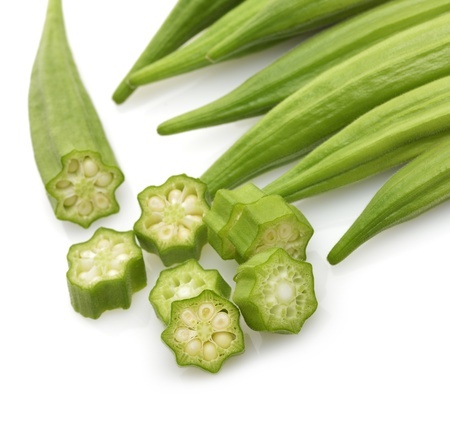 Okra may have been introduced to southeastern North America from Africa in the early 18th century. By 1748, it was being grown as far north as Philadelphia. Thomas Jefferson noted it was well established in Virginia by 1781. It was commonplace throughout the Southern United States by 1800, and the first mention of different cultivars was in 1806. The species is a perennial, often cultivated as an annual in temperate climates, and often grows to around 2 metres (6.6 ft) tall. As a member of the Malvaceae, it is related to such species as cotton, cocoa, and hibiscus. The leaves are 10–20 centimetres (3.9–7.9 in) long and broad, palmately lobed with 5–7 lobes. The flowers are 4–8 centimetres (1.6–3.1 in) in diameter, with five white to yellow petals, often with a red or purple spot at the base of each petal. The fruit is a capsule up to 18 centimetres (7.1 in) long with pentagonal cross-section, containing numerous seeds. Abelmoschus esculentus is cultivated throughout the tropical and warm temperate regions of the world for its fibrous fruits or pods containing round, white seeds. It is among the most heat- and drought-tolerant vegetable species in the world and will tolerate soils with heavy clay and intermittent moisture, but frost can damage the pods. In cultivation, the seeds are soaked overnight prior to planting to a depth of 1–2 centimetres (0.39–0.79 in). Germination occurs between six days (soaked seeds) and three weeks. Seedlings require ample water. The seed pods rapidly become fibrous and woody and, to be edible as a vegetable, must be harvested when immature, usually within a week after pollination. Okra is available in two varieties, green and red. Red okra carries the same flavor as the more popular green okra and differs only in color. When cooked, the red okra pods turn green. The most common disease afflicting the okra plant is verticillium wilt, often causing a yellowing and wilting of the leaves. Other diseases include powdery mildew in dry tropical regions, leaf spots, and root-knot nematodes. The products of the plant are mucilaginous, resulting in the characteristic "goo" or slime when the seed pods are cooked; the mucilage contains soluble fiber. Pods are cooked, pickled, eaten raw, or included in salads. Okra may be used in developing countries to mitigate malnutrition and alleviate food insecurity. Young okra leaves may be cooked in a similar way to the greens of beets or dandelions. The leaves are also eaten raw in salads. Okra seeds may be roasted and ground to form a caffeine-free substitute for coffee. When importation of coffee was disrupted by the American Civil War in 1861, the Austin State Gazette said, "An acre of okra will produce seed enough to furnish a plantation with coffee in every way equal to that imported from Rio." Greenish-yellow edible okra oil is pressed from okra seeds; it has a pleasant taste and odor, and is high in unsaturated fats such as oleic acid and linoleic acid. The oil content of some varieties of the seed is about 40%. At 794 kg/ha, the yield was exceeded only by that of sunflower oil in one trial. A 1920 study found that a sample contained 15% oil. A 2009 study found okra oil suitable for use as a biofuel. Bast fibre from the stem of the plant has industrial uses such as the reinforcement of polymer composites. The mucilage produced by the okra plant can be used for the removal of turbidity from waste water by virtue of its flocculent properties.